Without a doubt, the most crucial part of any race is how you get off the startline. Sailing off the line at the favoured end in clean air, ahead of your competitors allows you to control the fleet in to the first tack and help cement your position in to the first upwind mark. 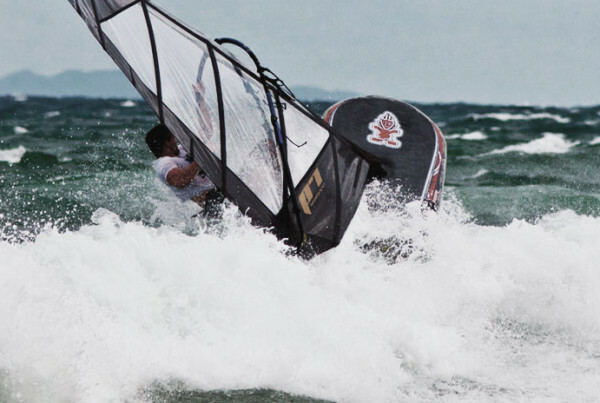 That being said, great starts are one of the most difficult skills to master in windsurfing racing. 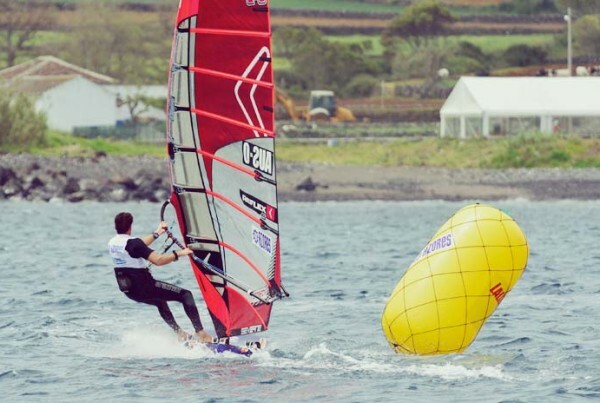 We have already looked at some basic starting tactics in a previous article, so in this ‘Part II’ of formula windsurfing starts we will revisit some of those ideas and explain them further, as well as introduce some simple ideas on how you can test startlines accurately everytime. In a fleet of 50 boats, roughly 4-5 sailors will get a great start, another 10 will get an OK start and the rest of the fleet will get a bad start. There is usually not enough “clean air” for everyone to have room to get a great start. For simplicity, a startline can be divided in to 5 areas. Typically, when starting on port tack sailors look for a pin-end start to travel to the right side of the course and/or reduce the number of upwind tacks. Starting in the middle of the line on port is usually a result of having to dip behind Starboard sailors, and thus for simplicity, the line can be just divided in to pin-end and boat-end for port starting. HOW DO WE QUICKLY TEST THE LINE FOR STARBOARD/PORT FAVOUR? When testing a startline, keep it simple. Look for ‘major’ advantages; you are not able to pick 1-2 degree changes by eye. A quick and easy way to test whether the line is boat, middle or pin end favoured is to sail to a spot about 2-3m directly downwind of the start boat and on Starboard tack, begin a short upwind run from that mark. Look at the angle you are sailing out of the line. If you are able to cross the startline within 10-15m of the starboard you can ‘generally’ say the line is boat favoured. If you take nearly 20-30m to cross the startline from 2-3m downwind of the boat then the line is more favoured towards the pin of the line. Figure 2A shows this drill being performed. Remember you are only looking for ‘major’ differences between the favoured ends of the line. The distances shown in blue in Figure 2A should be measured by eye ‘roughly’. On a planing windsurfer you travel too fast to be able to measure individual degrees or metres on the water, so your aim here is to just be able to tell whether the line is boat or pin-end favoured. Repeat this same drill on port tack from the pin end of the line. Assuming the wind hasn’t changed dramatically since your test at the boat-end, using deduction you should be able to get a better idea of which end of the line is favoured. *NB. If a line can be crossed easily on Port tack, then the PIN-END will be favoured if you decide to start on Starboard. A good race director will set the top mark directly upwind of the startline. As we know, courses are not always perfect and marks can sometimes drift, so it’s important you always check upwind from the centre of the startline how the first mark sits in relation to the startline. If the mark is placed dramatically to the left or right side of the course, you may wish to change your start position to get toward the particular side of the course the mark is placed in quicker. If there is a majorly favoured side of the course due to one of the above factors you should investigate whether to change your start position to take advantage and sail to the favoured side of the course quickest. In Figure 3A a windward/leeward course with a reach mark is being used. The line is slightly port favoured (notice the direction of the wind) and Sailor 2 has started at the pin end on starboard tack. The first mark has been placed dramatically to the right side of the course, and Sailor 1 has seen this and tacked on to Port for a boat-end port start taking him to the right side of the course quicker and taking advantage of the better angle on Port tack. This is an example of when a startline may have been Pin-End, Port favoured, but getting to the right side of the course may have been more important, so a boat-end Port start could be utilised. Something that is often overlooked but is still a crucial factor is understanding and knowing your abilities against other sailors in the fleet. It might not be possible to line-up against every sailor before a race start or you may have never sailed against this fleet before, but where possible, note your pointing angle and speed relative to the sailors you consider your main rivals in the fleet. It is not always a good idea to start in a position which may give you a direct disadvantage against a rival sailor. An example of this is someone who sails very fast upwind but at a low angle. If that sailor was to start above the line on starboard against a sailor who sailed slower, but pointed much higher, he may not be able to clear the higher pointing sailor and have to dip below them, thus negating the extra speed. In this instance a better tactic would have been to start just below this high-pointing, slower sailor to blast with extra speed off the startline and be in clear air even with the lower angle upwind. One of the secrets to a great start is to not have better sailors in close proximity to you who can take your clean air and/or force you to tack early. If you sail in a regular fleet you should have a good idea who the better sailors are and know their strongpoints. By knowing who the stronger sailors are, you can also identify the WEAKER sailors. When jostling for positions on the startline, you can often find gaps on the line to accelerate in to where the weaker sailors are positioned. Once you’ve ascertained where you think you will be starting on the line, it is now important to get a TRANSIT of the startline. A transit is an imaginery line that runs through the startline to a marker on the shore so that at any point you can work out where you are on the startline relative to this marker. To get your transit, park yourself at the startboat (either on the inside of it if it is a big boat, or on the upwind, outside of it if you can see through the boat to the pin-end buoy standing on your board) and line yourself up with the pin-end buoy and the flagpole on the boat. Imagine a piece of string between each end of the line then extend this mental string all the way to a clearly visible landmark on the horizon. Now that you have that marker on the shore, drift upwind/downwind a few metres and get an idea of how that marker changes in relation to the line. Getting a reference to your shore marker above and below the line will help if you need to sail over/under someone on the line during the pre-start. The transit becomes very important in larger fleets with longer startlines. The larger the fleet, generally the ‘transit-sag’ becomes bigger. The transit-sag effect is that the sailors in the middle of the line will drop 3-4m below the level of the line because they believe they are over the line. This is what makes a ‘middle of the line, starboard start’ quite famous as in planing conditions you can sail over the top of these sailors taking their clean air and creating a gap for you to accelerate in to. Syncing your watch correctly with the starter is extremely important. A planing board travels at 8m per second, so if you sync your watch 1 second out you are throwing away 8m at the start which is a huge margin. The windier it gets, the slower and more distorted sound travels as well as the more difficult it is for the starters on the boat to put the flag up and down. There can always be discrepancies between the sounding of the gun and the flag hitting the top of the flagpole. To make it easier on yourself, stay as close to the starboat as practical for the first warning signal and check the sync on the next signal to make any corrections. If you are downwind 100m from the starboat, by the time the sound of the horn reaches you, you are 1-2 seconds out of sync! Having your watched synced is extremely important for the final step in the ‘great start’. As mentioned earlier, in planing conditions, boards travel at 8m/sec, which makes major changes in direction very difficult. Formula boards are particularly unresponsive when you going from a broad reach to a tight upwind angle as you do when you are running the startline on Starboard tack. 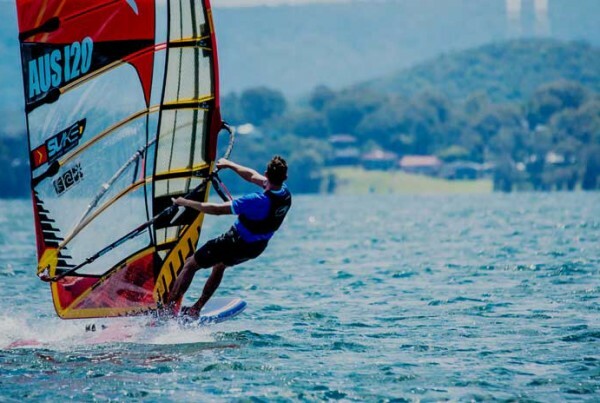 It might take you as long as 3 seconds to get up to a good upwind angle out of the start and as long as 8 seconds to reach full speed and angle. For this reason, in planing conditions (only!) if you are running down the startline you should ‘anticipate’ the starting gun and go on -1 seconds. Yes, go on -1 seconds. Why? Firstly because on the formula boards you require the extra second to begin rounding up in to the wind and secondly, because that extra second could give you the extra advantage to the sailors around you on the line, getting your nose in front of them and giving them dirty air instead of them doing it to you! Thanks this is a great article. One thing I would add is just to be safe too. No Barging. Here is a little video of what can happen when someone barges. From this weekends Ronstan Racing in San francisco june 13th. Classic Steve Bodner crash! Who does he run into? Someone on a North sail it looks like. For those interested, the crash happens at 2.15 mins. I haven’t got a rulebook in front of me, but from memory in this case, two things apply: ‘windward boat stays clear’ and ‘overtaking boat stays clear’. It appears Bodner (USA4 on NP sails) would be in the wrong on both accounts. I took some GoPro headcam shots at the Formula Worlds last year in Santa Pola. I forgot how great it is for learning about starts. I should endeavour to shoot some more. Thanks for the video David. Nice article. I seem to remember that the distance to the weather mark is the same on port or starboard if both start at the same point regardless of weather mark location. If the line is square, all points on the line are equal distance from the mark regardless of location. If the line is not square, the difference in distance from any two points is only the difference upwind or downwind between the two points. The real racing difference is the two tack starboard leg vs the one tack port leg if there are no shifts. In addition the starboard tack carries more risk because the layline is achieved very early and only bad things happen on the layline–lifted=overstood and headed = eating the header or tacking three more times. Generally better to sail the long leg first and to postpone the arrival at the layline until late in the leg. However,wiith formula the tacks are very expensive, so throwing in a bunch of tacks to stay off of the layline won’t work. The diagram 3A shows a massive difference in tacking angle between port and starboard sailors. I believe the diagram would show the above if the angles were the same. To quote Dennis Miller, “just one man’s opinion, I could be wrong”. Hope this helps. @ Jim Pollock – totally agree with your statements, although is that correct if the line is square than all points on the line are equal distance to the mark regardless of location? I would have thought a top mark that is very biased to the right would be closer to the right hand side of the line, closest to the boat? Need a pen and a ruler and a bit more sleep before I think of that one more. Funny, but I would said that the port tack first beat carries more risk mainly because you have to pick the layline from soooo far from the mark and at the speed of formula boards, missing laylines by metres is detrimental because you can’t add extra tacks. On starboard you can make the first tack anywhere (on the layline or earlier) and get another opportunity to get the layline spot on closer to the mark for the second tack. Agreed that the difference between both options should only be the extra 1 tack for the starboard beat option but it’s good to know all the options because it’s all too common to have startlines that are biased either way and courses that aren’t perfectly lined up with the line, which gives an advantage to the sailor who spots it first. Now to put some numbers to how critical the tacks are, as I mentioned, if we’re travelling at 8m/sec and the top pros take 8 seconds to regain full angle and speed again on the new tack (that’s the TOP pros), then you’re throwing away 64m every tack. If you’re taking double that to tack then it’s 128m. If you go starboard tack both laps and the winner goes port he’ll beat you by 256m if all other variables are even. I like that Dennis Miller line!